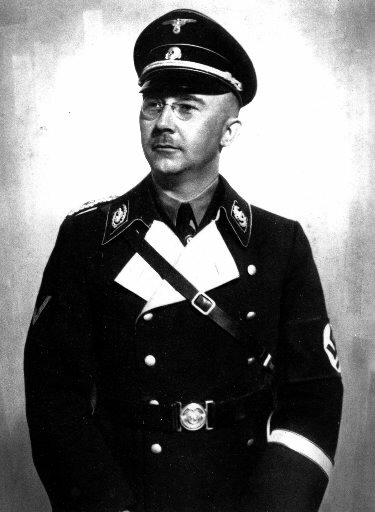 I have always been disappointed by the unimpressive appearance and equally banal character of Heinrich Himmler. For a man that ran the SS, a virtual private empire within the Third Reich, one would expect a stunning genius with a matching body of Teutonic steel. Instead, Himmler was a physically weak bureaucrat and former chicken farmer who resembled a half-caste Mongolian tax auditor. In the documentary Heinrich Himmler: Anatomy of a Mass Murderer, the viewer is briefly introduced to Himmler's unimpressive character and career as Hitler's #1 paper-shuffling killer. In Hannah Arendt's classic work of philosophy Eichmann in Jerusalem, the female German-Jewish philosopher devised the phrase "the banality of evil" regarding the desk-murderer career of Herr Eichmann. That being said, I think the phrase "the banality of a homicidal inferiority complex" would best sum up Himmler's life story. As revealed in the documentary Heinrich Himmler: Anatomy of a Mass Murderer, despite being a sickly child with the martial prowess of a pussycat, Himmler was always a strict German nationalist who romanticized war. Himmler grew up in a Roman Catholic household with a strict authoritarian father who demanded unwavering discipline from his sons. As described in the documentary, in his childhood, Himmler developed the ruthless cold psyche that would help him to efficiently run the SS in a most unsentimental manner. Unsurprisingly, it is revealed in Heinrich Himmler: Anatomy of a Mass Murderer that Himmler truly believed in the National Socialist ideology and was completely obedient to Adolf Hitler. As the documentary briefly explains, Himmler attempted to create an anti-Christian neo-pagan order out of the SS, but ultimately failed. Although not revealed in the documentary, Himmler hired former mental institution patient Karl Maria Wiligut to be his virtual "Occult priest" at his castle Wewelsburg (which Himmler hoped would one day be the allegorical "center of the world"). Despite the fact that only a small fraction of Germans during the Nazi era were of pure Nordic Aryan stock (most were Alpine types), Himmler hoped to racially purify Germany and restore it to the racial character described in Tacitus' Germania. Interestingly enough, various Himmler biographers have stated that the SS Reichsführer might have had Mongolian and Jewish ancestry. Either way, I think most people will agree that Himmler certainly lacked the ideal Nordic profile he so stringently demanded in his SS men. Although Heinrich Himmler: Anatomy of a Mass Murderer does not go into much depth regarding Himmler's dubious ancestry, the documentary features the SS leader's great-niece Katrin Himmler, who is ironically married to an Israeli and only has contempt for her great-uncle. According to Katrin, in an attempt to hide their shame, the Himmler family went on to describe Heinrich as a "black sheep" after the second World War. As briefly mentioned in Heinrich Himmler: Anatomy of a Mass Murderer, Himmler's daughter Gudrun Burwitz would go on to be a Neo-Nazi sympathizer of sorts and still holds much love for her deceased father. Despite having total control over the SS, Heinrich Himmler was unable to efficiently run it on his own. Reinhard Heydrich, who was described by the Nazis as the "ideal National Socialist," is known to have run the more crucial departments of the SS, especially those sectors responsible for the liquidation of Jews. I would have liked for Heinrich Himmler: Anatomy of a Mass Murderer to have gone in better depth regarding Himmler's relationship with Heydrich, but instead, the documentary only succinctly mentions it. At best, the documentary is an "okay" introduction to the life and killing times of Heinrich Himmler. Heinrich Himmler: Anatomy of a Mass Murderer is comparable to the kind of documentary you would find on the History Channel, as the film barely delves into the more interesting elements regarding Himmler and the SS. In the end, Himmler ended up killing millions of people for nothing, eventually betraying Adolf Hitler by attempting to make a deal with the allies in early 1945. Himmler met a very bitter and lonely end, having all his ranks stripped from him and eventually committing suicide the same way Hitler did. 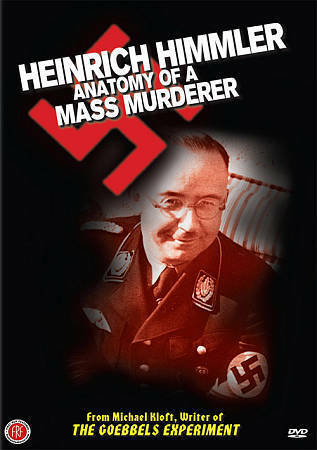 For those already familiar with Himmler, Heinrich Himmler: Anatomy of a Mass Murderer will offer you no new insights. For more info on the documentary, visit First Run Features.